Since coming home from the crop last weekend, I've had so many ideas for layouts. I've tried to scrap a bit each night. At the crop, I made a 2-page layout of Kevin's 1st grade field trip, but there were two photos that sort of told another story (about how he still wants to do things with me), so I wanted to keep them on a separate LO. I used the same products (Fancy Pants' Rough & Tough line) that I used for the field trip pages. It makes me sad to see how fast Kevin - my baby - is growing! Using the American Crafts "Love" kit that I picked up at the crop, I think I'm going to be able to scrap several photos of my niece Reese. (And believe me...there are MANY photos of Reese!) For "3Weeks" I scraplifted a layout that Shannon Zickel used as an example with the kit. I mixed it up a bit and made her 12x12 example into an 11x8.5. I also took another Shannon Zickel 12x12 example and altered it into an 11x8.5 for "watch her grow." These photos of Reese from just one month apart crack me up! Finally, one last Reese LO for Kevin's album. 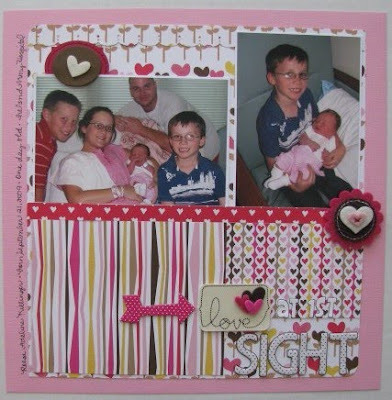 I lifted a LO by Lynn Ghahary in the April issue of Scrapbook Trends. The other night I pulled out my American Crafts "Kids/School" layout and used the example Shannon provided with the kit with a few alterations to make this "Wild Wheeler Fun" LO for Blake's album. He loves spending time over at Uncle Terry's! As of now, we are officially on Spring Break! YAY!!! We still have lots to do to get ready for Easter (it snuck up on me!) and with the forecast of pretty weather, we hope to spend a lot of time outside. Great LO's Amy!! Love seeing all that pink! :o) Happy Easter, I hope you have a great weekend! Love all your layouts, you did a great job using these American Crafts lines! I think you must love your last name, how fun! LOL! LOVE LOVE the Wild Wheeler pager! So many adorable LO's, Amy! So cute, happy & colorful... my fav kind!